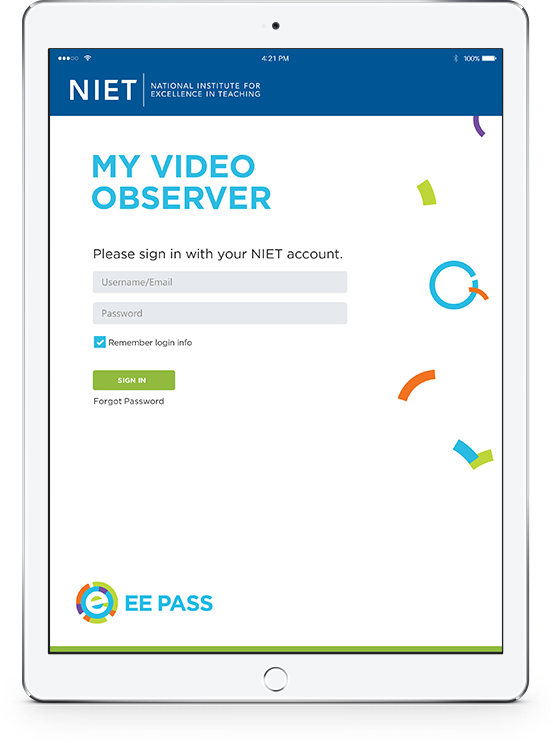 NIET provides both on-site and online support to states, districts and schools across multiple aspects of educator effectiveness through educator evaluation, professional development and teacher leadership. An essential element of effective teaching is providing regular, timely evaluation and feedback. But creating a robust evaluation system takes significant time and resources. Learn from experts who are passionate about teaching. Switch between your computer, tablet, or mobile device to gain access to hundreds of unique training modules. Each video will help further your understanding and effectiveness in various areas. Choose what you’d like to learn! Our extensive resource library contains hundreds of sorted and organized material including videos of the latest educational technology, documents that can be shared and collaborated on, templates for your classroom, and many more resources. Video Observer enables observers to capture real time classroom lessons by teachers and provides a forum for the teacher and their coach to discuss the lesson. It builds teachers’ practice by enabling them to see how their students are responding as they teach, and allows coaches to provide detailed, timely feedback and support for improvement. To streamline the evaluation process, we provide a powerful tool with the ability to certify evaluators online. This is a useful and convenient component of NIET's robust educator evaluation system, offered through NIET. Each teacher receives an individualized dashboard that contains updates and alerts for important events and content, feedback, and reporting of progress throughout the year. Here you will be able to gain access to many other feature brought to you by NIET. Throughout the year you will receive an individualized report that contains updates of your progress throughout the year. Here you will be able to gain access to more in-depth reports for each specific area. Our surveys are specially designed to gain insightful information into various areas of the education profession. They include student surveys to help understanding of teach effectiveness, parent surveys to support communication between school and family, as well as many more areas of surveil need. Ensuring Accurate Feedback from Observations offers methods to ensure that classroom observations provide teachers with the critical feedback they need to improve their practice and addresses key considerations and lessons from early implementers. Recognizing that an effective teacher is the most important school-based factor impacting student achievement, the National Institute for Excellence in Teaching (NIET) is committed to ensuring a highly skilled, strongly motivated and competitively compensated teacher for every classroom in America. Equipped with a diverse staff of educators, researchers and policy experts, NIET seeks to accomplish this mission through two signature initiatives: TAP™: The System for Teacher and Student Advancement and our Educator Effectiveness Series. Support hours: 8:30am – 5:30pm CST. NIET responds to e-mail inquiries and phone inquiries in the order that they are received. It is not necessary or recommended for you to send duplicate points of contact. These duplicate contacts create additional responses our team will have to execute and can prevent efficient support response time. We guarantee we will respond to your inquiry by the next business day (even if it is to notify you that it will take longer than 24 hours to resolve your issue).